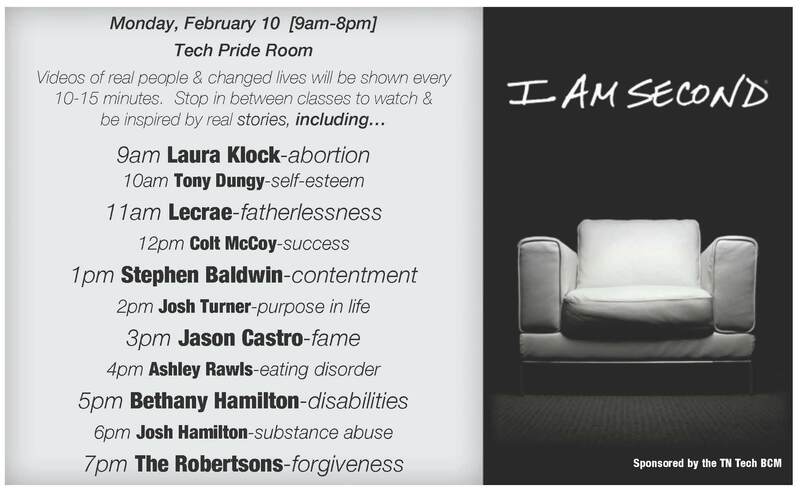 UPDATE: On Feb. 10th from 9am-8pm, we transformed the Tech Pride Room into a coffee shop atmosphere where we showed I Am Second videos every 15 minutes and BCM leaders shared their testimonies in between. 1 female student from Saudi Arabia heard the Gospel for the first time from a BCM student and stayed to watch four videos. 3 students asked for follow up to help them make Jesus first in their lives. 4 Students asked for follow up to know how they can start a group to reach their friends. 6 churches participated with leadership, prayer, and by bringing snacks. 37 BCM students shared their testimonies between videos of how Jesus has changed their lives, many for the first time. 39 I Am Second testimonies were shown over 10.5 hours on campus. We saw a couple of hundred students come through the room to watch at least one video & hear at least one BCM students testimony. BCM students had conversations with a few hundred more students and faculty as they invited students to come in to the room and while explaining what “I Am Second” is all about.